Ian Gawler: Out on a Limb: Controversy – to speak or not to speak? And amazing photographic proof. Controversy – to speak or not to speak? And amazing photographic proof. It is a difficult thing this. Six years ago, the accuracy of my cancer diagnosis was challenged by 2 oncologists. They put forward a hypothesis that the secondary cancer that created large lesions throughout my body, and from which I recovered, was not actually cancer at all – just tuberculosis (TB). 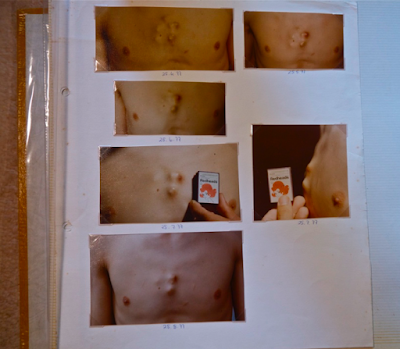 This is what they called TB – photos of my chest in 1976 showing extensive secondary bone cancer protruding from my sternum (the boney part in the middle of the chest). These lesions were solid bone - as hard as any bone in your body - the consequence of secondary bone cancer spreading. The truth is that I did have both. I did develop secondary osteo-genic sarcoma first, and this was complicated later by a TB infection (in my left lung only) that most likely started after I had chemotherapy for the cancer, and that chemotherapy actually weakened my immune system. Scientifically, the doctors were quite within their rights to put forward the TB only hypothesis. Not sure what their motive really was, but in the event, their challenge and the way it was reported in the Press appeared to attack not only my own credibility, but also that of the lifestyle based cancer support work I have been involved with for over 35 years. The dilemma at the time was whether or not to respond in public to the hypothesis. My concern was that if it was not made completely clear that the hypothesis was wrong, then sections of the public might become confused and conclude that if the diagnosis was incorrect, then the work itself was in some way invalid. This despite the fact that the work had been clearly shown to be helping so many people for over 30 years by the time this controversy unfolded. Clearly the validity of the work stands in its own right and is not dependent of my own personal medical history, but clearly also, the two are intertwined to some degree in the public view. So I did respond in an attempt to prove the facts. Unfortunately, the press at the time seemed more intent on fueling controversy than establishing the truth. Despite clear evidence the “TB only” hypothesis was incorrect, there has been no admition from the doctors concerned that they were wrong, and no clear statement in the scientific or popular Press they were incorrect and that I did in fact undoubtedly have secondary cancer. Therefore, in some sections of the community, confusion was created and has lingered, some confidence has been lost, and some people in the ensuing years have stepped back from engaging with self-help programs – a very regrettable outcome. Hence the difficulty. Given Google’s capacity to enable old material to remain prominent on the net for years, this uncertainty carries on in the minds of some. So do I just wear it as it were, or do I continue to respond? Many suggest in these types of situations not to respond. There is good spiritual advice to simply accept personal criticism – good, sound advice. The PR spin doctors often recommend to keep quiet in the face of work criticism. Yet six years after all this was first aired, there still seems to be some uncertainty amidst some sections of the community. It is of deep concern that it seems to be causing some people in need to be standing back and missing out on what could help them; maybe even missing out on what could make the difference for them between life and death. So what to do? In the lead up to presenting a meditation retreat and then a specific residential program for people affected by cancer in New Zealand, I was invited recently to speak with Kim Hill on Radio New Zealand. There was no prior indication of what type of interview she had in mind. Kim is a senior and well-respected journalist who has a reputation for being “rigorous”. She prepares thoroughly, is very well informed and can be confronting. Kim has a huge following of people who love the way she interrogates some, dismantles others and basically exposes people for what they are. She can be quite daunting! Alternatively, she also has a great capacity to be light and witty. Shall we say it was lively? Kim dived straight into all the controversies with some vigor! From the diagnosis to coffee enemas and on to the basic relevance of the self help approach in cancer medicine - and many parts in between. Thanks for the kind feedback and support that has been offered by many who have listened to it already; it seems many appreciated what they perceived to be the benefit of my meditation practice enabling a calm manner and voice to endure under tough questioning. What the synopsis has not included is the discussion around a key question asked during the interview – How can you be sure your diagnosis was accurate and the TB only hypothesis was false? In another blog, 11 points have been recorded that clearly establish the truth of the secondary cancer diagnosis. The most incontrovertible of these in my opinion concerns the fact that I was treated with chemotherapy, and what the consequences of that treatment were. The chemotherapy I received has no known activity against TB. This means it could not cause TB lesions to shrink. 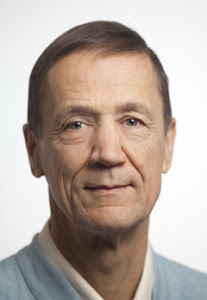 Also, as chemotherapy dampens the immune system, the world authority on TB – Dr Jonathan Streeton- who treated my TB was adamant that given how widespread my lesions were, if they had been TB, with no defences to resist it, the TB would have become rampant, and he was convinced I would have been overwhelmed with infection and died. The facts of what did happen during the course of my chemotherapy are very clear. Firstly I did not get worse. Nor did I actually die! Secondly, the cancer actually did shrink in response to the chemo; not a great deal, but enough to be clear that it was having some effect on the cancer, not flaring up and aggravating TB. 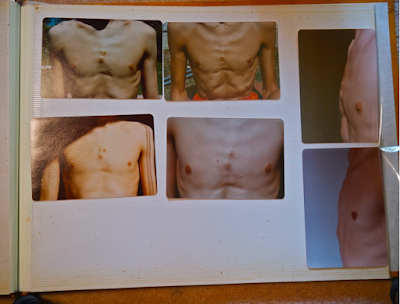 This shrinkage was confirmed by photos taken at the time in a series once each month – and added below - along with a letter I have retained from the treating oncologist at the time who actually measured and recorded the size of the visible lesions on my chest at the start and the end of the course of chemotherapy. So I must say I am curious… What do you think? Better to keep quiet? Or better to speak up? My sense is that this issue may well keep reappearing, at least for a while. I may be asked about it again in the future. What would you do? 1. Photo of my chest taken at the start of 10 weeks of chemotherapy treatment - October 1976. 2. The date when the above photo was taken has been questioned by some, but it comes from the days when Kodak actually printed the dates of printing on the photo’s reverse, so just to be completely clear, here is the reverse with the date made clear. 3. 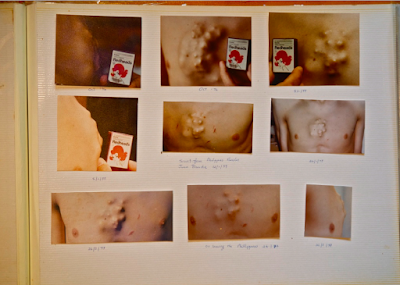 Three groups of sequential photos taken monthly of my chest by my first wife from the start of chemotherapy - showing a clear response to that treatment that continued on until all the lesions had gone 18 months later. The dates were written at the time under each photo, but these dates are not so clear when reproduced here. 5. 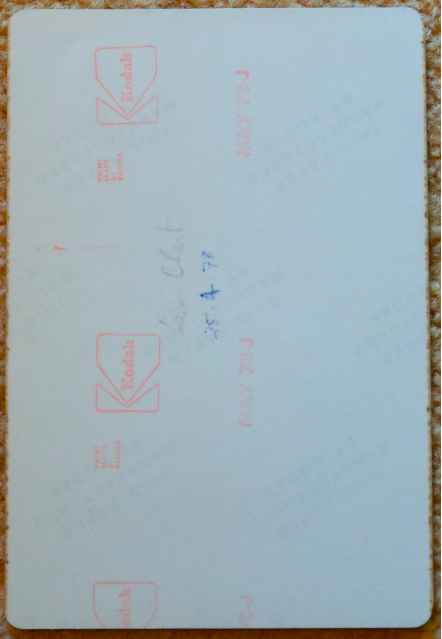 Reverse of the photo above showing its date clearly confirmed. Dr Ian Gawler, who is in New Zealand with his wife Dr Ruth Gawler to run courses including a residential programme, talks with Kim Hill. A synopsis from the interview put to air Saturday 22nd October 2016. And here is the link – CLICK HERE . Dr Ian Gawler is one of Australia's most experienced authorities on mind-body medicine and meditation. He was diagnosed with osteosarcoma, or bone cancer, over 40 years ago. His right leg was amputated, and then he was told the cancer had metastasised into a lung, his pelvis and his spine. He was given only two weeks to live. That diagnosis and Dr Gawler’s claim to be the only person in the world to survive secondary osteosarcoma have come under scrutiny in Australia. He has become the centre of an argument about the ethics of the promotion of the mind’s ability to cure cancer. Dr Gawler says that after his diagnosis with osteosarcoma in 1975, he got the best medical advice he could, as well as scouring medical libraries. He could find no evidence of anyone living more than six months with a condition such as he had. He then had chemotherapy, which he says was not meant to be curative. Yet Dr Gawler wants to make it clear he’s not anti-science or anti-medicine. “That’s never been the case. I’ve always been interested in how you get the best out of both worlds." Cancer treatment has three aspects, as he sees it – getting the best medical help you can, looking at natural and complementary therapies that might be useful and, most importantly, doing what you can do for yourself. He believes that through lifestyle changes “applied fairly intensively” people can greatly contribute to their own recovery and wellbeing, alongside other treatments they may be getting. He says he's troubled that even though one of the major potential causes of cancer is bad diet, many doctors still get virtually no training in nutrition. Coming from a veterinary background himself, therapeutic nutrition makes very obvious sense. “You go to the vet with a pet and one of the first things you’ll always be asked is ‘What are you feeding your dog or your cat?’ Because it’s important. When you get heart disease, a doctor will tell you at the first appointment how lifestyle change can have a positive effect on your disease, he says. The fact doctors don't often have such conversations at the time of cancer diagnosis is “an incredible error of omission,” Dr Gawler says. A diet that aids recovery from cancer is anti-inflammatory and regenerative, he says. He guesses his own cancer was caused by a "very high-meat diet" and his "typical cancer prone personality" (also known as the C-type personality). So what is this personality type? “Their way of stress management is to try and please people, to be compliant. They tend to be people who have difficulty saying no to requests and they tend to internalise their emotions. Dr Gawler recommends people diagnosed with a major illness start doing what they can to live as healthily and happily as possible. Being active in your own treatment can reverse some of the fear, he says, and even help people die peacefully. Again, here is the link – – CLICK HERE . 1. I have never actually claimed to be the only person in the world to recover from secondary osteogenic sarcoma as is stated in the synopsis. What I have said is that when diagnosed with secondary osteogenic sarcoma in 1975, I could find no records in the medical literature of that day of anyone surviving more than 6 months. This latter fact is reported in the synopsis. 2. It could be misleading that it is said in the synopsis that my cancer “was caused by a "very high-meat diet" and his "typical cancer prone personality””. Cancer is a multifactorial, chronic degenerative disease. While i agree that the 2 issues listed were significant, to be clear, there were other issues as well, not just those two. If you are interested, in You Can Conquer Cancer there is a full chapter on what i regard as the main causes of cancer, including detail of the cancer prone personality. Ian Gawler's diagnosis - if it looks like a duck... Lists the 11 pieces of medical evidence that clearly establish my diagnosis of secondary osteogenic sarcoma (bone cancer) and dismiss the TB only hypothesis. I think continuing to speak up is important. If it was just you defending your position versus (poorly founded) criticism then silence is probably the best course - it avoids getting into a cycle of self-justification. But this is not the case. As you note the criticism has real, harmful consequences for others so I think needs to be refuted where possible. Thanks Martin, it does seem like defending those who may be adversely affected by all this is actually worthwhile. Thanks Natalie - good question. It is a pretty full on situation being questioned rather vigorously by Kim. I actually said a few things wrong or that could have been better expressed. That is just the way it goes. It must be extremely difficult for politicians who are doing this all the time and having people ready to pounce on any miswrote they utter. They have my admiration for sticking at it at least. 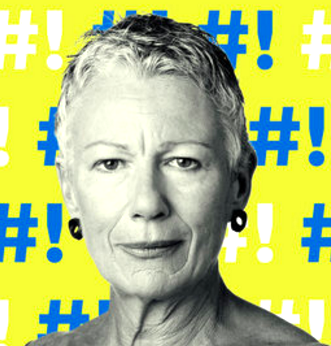 Conquer Cancer' and started on a vegan diet with 7 juices a day and, of course, meditation. the years you have put into assisting people like myself. Our lives have truly changed and we are grateful for every day we have. All the best Ian and keep up the wonderful work. This is why I do it! So good to hear stories like yours of long term recovery; to know that hope is real. My concern with not responding to the controversy is that some people remain confused and stand back, thereby missing out on the benefits you have received. More power to you! I think you have to keep speaking up because your story has given so much hope to other people who have been diagnosed with cancer. Your work has been extraordinary too. Your work and your story are linked so your credibility is important. Thanks Denise, I know the story and the work are linked in the minds of many, but if you do think about it, the work clearly does stand in its own right. It may have been inspired to start by my story, but now so many others have done well using the same principles, that the work has its own life. It makes me feel really angry when I hear people doubt the validity of your work. I believe that the lifestyle changes that I made as a direct result of your teachings saved my life. I think you have to defend yourself and speak out against those who challenge the very essence of your life's work. It's awful that you have been put into this position. You need to keep speaking out because your story has given hope to so many people diagnosed with cancer. Your work has been extraordinary too. Your story and your work are linked so you need to ensure the truth is clarified. I think you did a fantastic job with this interview, and that it is well worth doing these things because you have the ability to use them effectively as opportunities to spread information about different and alternative approaches to dealing with cancer, i.e. to get the word out there. You might set out the case for nutrition and meditation in dealing with cancer in more detail, with clearer reference to the vast body of research evidence on these issues, and then question the ethics of not informing patients of these things? Thanks Kate. There is no doubt that if a doctor did not provide advise about lifestyle changes to a newly diagnosed heart patient at first diagnosis, they would be deemed to be negligent. I suspect that doctors who are not doing this in cancer medicine lay themselves open to negligence claims. Hi Ian, so pleased you spoke out. My husband and I have been following you, and supporting the Foundation, for many, many years. Have read your books and have nothing but admiration for you and all you have done to help those with ill health. Great point Romi. Prevention is the way to go; maybe we can just call it wellness. It is like in a room filled with light - there is no darkness. In a healthy body and mind, there is no space for illness to take hold. Hi Ian, Thank you for sharing this challenging event, your work and steady presence is so valuable, so keep speaking out, and at the same time we know that mind-body healing is also perceived as a threat to professionalised ignorance which prefers to judge and generalise rather than care for each person individually in their uniqueness. Thanks Giles, my sense is that we all look forward to the day when mind-body medicine is regarded as a crucial element of standard medical care. The logic behind this aspiration is sound; it has to come with time. The sadness is what happens to those who do not manage to find its help in the interim. As a close friend, I'm really glad that you decided to put these pictures up. 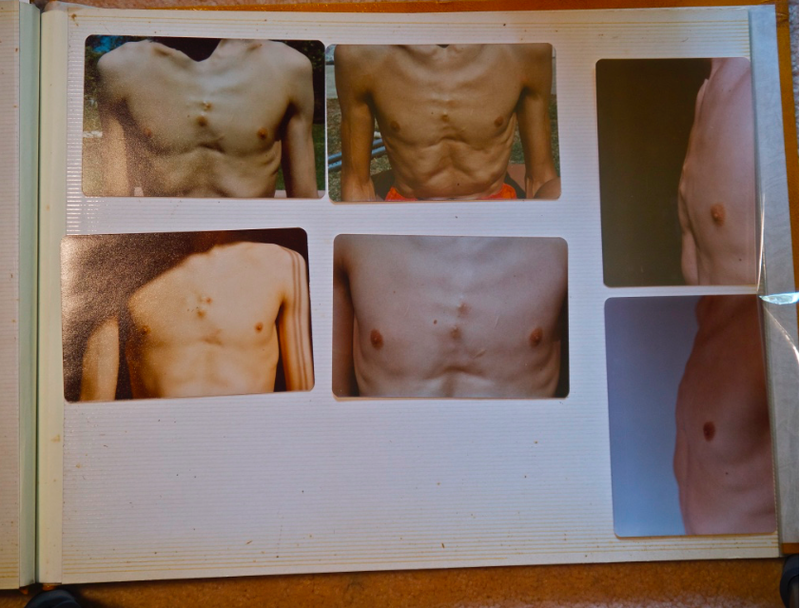 They really speak for themselves and even blind Freddie can see that these tumours don't look like TB and any doctor knows this is not how TB presents. Where was the voice of Dr Ivan Burns, the Oncologist who diagnosed Metastatic Osteogenic Cancer in the 1970s and commenced chemotherapy and later radiotherapy? Why did he let the Haines and Lowenthal team imply that you had made that diagnosis?.. as if he would have treated you with cytotoxic drugs if he had had any doubts that you had secondary bone cancer. Where was his duty of care as your treating doctor? And how come Dr Jonathan Streeton - Respiratory Physician and TB expert would not agree to you publishing the letter in which he stated that the illness could not possibly have been only tuberculosis. Why was he so afraid to stand by his clinical judgement? This is the dark side of so called medical authorities when more governed by base emotions like envy and fear than decency. You have amazing strength Ian - adamantine I'd call it- and tenacity and real commitment to helping patients with cancer not to lose hope. I believe that in the end truth always wins, so thanks for all you do. Some good questions raised here... But just to note, the radiotherapy came before the chemotherapy and the chemotherapist had nothing to do with that. Hi Ian, I understand the dignity in saying nothing, but I also believe when you know you have important information to share, there is a duty to share this too. I admire the way you have spoken out, not retaliatory or aggressively; but calmly and confidently. This air of grace is what leads people to listen, thank you for all you do! Hopefully, one day, the medical system will embrace what you are already sharing (but I suspect unfortunately they will likely claim the credit for their "new approach"). I think it's very important that you have spoken out against these medical naysayers & provided photographic evidence that is very much conclusive. Otherwise people see professional qualifications in the field, a negative opinion & just look no further. The work you do & your own remarkable struggle against cancer deserves far better than that. Found your comments about people with advanced cancer who follow an anti-inflammatory diet & practice meditation dying peacefully without pain informative. That's exactly how my brother Mike died after 6 years with metastasised pancreatic cancer. Refusing chemotherapy he attended your retreats as part of his alternative therapy & benefited greatly from the experience. Seems like your brother was indeed a long term survivor. 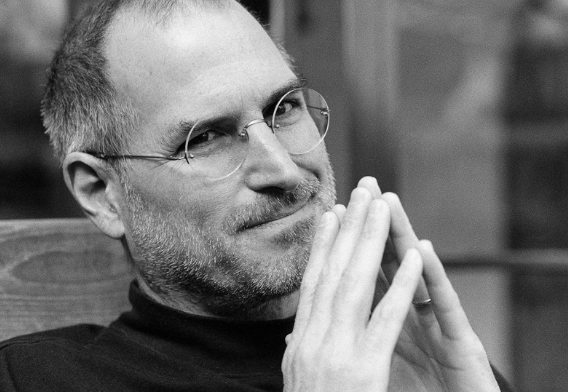 Secondary pancreatic cancer is a difficult one and it can be painful, so to know he had a peaceful death without pain is good testament to what he did. Hello Ian, I drew hope from your and other's successes - thank you for doing what you do and speaking out - please continue to do so. There is nothing that provides hope as directly as the power of a personal story. The good thing is that these days, mine is just one of many in the cancer field. Thanks for this insightful post for me to share with clients.